I've been on bit of a reading kick lately. Or maybe, I've been on a bit of a I-need-a-few-minutes-to-escape-the-the-bits-of-chewed-up-crayons-now-burrowing-their-way-into-my-white-carpet-next-to-the-orange-juice-spills-and-unidentifiable-dog-funk kick. It's probably a little from column A and column B, either way I've been reading a lot. But not just reading a lot -- becoming immersed in books. And craving the next one like that salted dark chocolate and almond bark I recently discovered at the grocery store (what? it's in the organic section so it must be good for me, right?). I devour pages as I scarf down my bowl of bran flakes in the morning. I sneak pages when rocking Jovie before her nap. And I race through them while the girls play in the bathtub (careful to protect them from errant splashes -- our bathroom is cozy). Last month I found myself reading four books at one time. Well, not all at once, obviously. Rather, I was in the middle of four books at once. It all started back in July when I went to Denver. 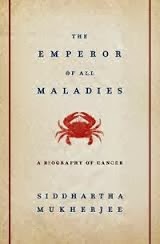 While browsing the shelves at the Tattered Cover I picked up "The Emperor of All Maladies: A Biography of Cancer" by Siddhartha Mukherjee -- a Pulitzer Prize winner on sale for just $7. I read the first few chapters standing in the store, which is no easy feat, considering the book weighs, roughly, as much as my 3 year old. A few people questioned why I would want to read a book about cancer, and the answer is pretty straight forward: I like science books (I should add science books written for non-sciency sorts), it grabbed my attention off the bat and I needed something to read for the flight home. I plowed right through the first half of the book, which documented everything from the history of the disease to early forms of treatment to the PR campaigns that tried to raise awareness about it and money for research. It was fascinating -- for instance, did you know that modern chemotherapy has roots in things like artificial dye and mustard gas? Mukherjee is a cancer physician and researcher and a great storyteller (you know, as if, cancer physician and researcher weren't admirable enough). The information he shares was accessible to me up until he begins discussing the genetic research on cancer. At that point I would find myself reading and re-reading a single page or paragraph over and over again (or, more likely, falling asleep sending the anvil book crashing on my snoring face). A sample sentence: "Using transgenic mice technology, Philip Leder's team at Harvard altered the c-myc gene in mice, but with a twist: cleverly, they ensured that only breast tissue in the mice would overexpress the gene." Ah yes! Genius! Those tricky Harvard chaps and their brilliant transgenic mousing! If only I would've thought of that. It's not that Mukherjee is less effective at breaking down this complicated material for laypeople … it's just that it's really complicated material and I'm probably a bit slower than the average layperson. "Are you still reading that cancer book?" Brad asked me night after night after night. "Yes," I'd respond defensively. "I'm going to finish it." And, five months later, I did! I read the last page and in a big show, I smacked the book closed right in front of Brad's face. "Finished," I said, probably with more smugness than the occasion warranted. I was the one, after all, who took almost half a year to read 470 pages. (I'd actually started thinking I'd finish writing my own novel before I'd finish reading this book. And then I work up). 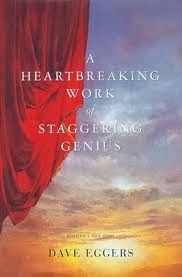 Anyway, whilst picking my way through the cancer book, my sister Laura kept quoting a book that she'd just finished, "A Heartbreaking Work of a Staggering Genius: A Memoir Based on a True Story," by Dave Eggers. "It reminds me of a book you'd recommend to me," she told me. "I think you'd like it." It was actually one I'd be meaning to read since high school or college, when my friend Megan was raving about it. So I decided to download it to my Kindle -- figuring it would offer a nice break from the cancer book. Turns out, there's a lot of cancer in this book, too. Not exactly the breezy repast I was looking for. Eggers captures the voice of that kid I was in my early 20s. The one so certain that the world needed to hear whatever it was I had to say and that I was going to do something world-changing and memorable only I had no clue as to how I was going to do it. The internal dialogue is uncomfortably self-conscious -- I suppose the hallmark of vulnerability -- but I imagine anyone who's weathered that phase of their lives can relate. It took me a while to get through this one, too though. Maybe because a lot of it made me cringe. Eggers, writing as a fictionalized version of himself, tells about becoming the guardian to his little brother after both of his parents die from cancer within months of each other. His child-rearing decisions -- basically leaving his brother to tend to himself -- contradict his monologues about philosophies of parenting. For someone who has such strong opinions about how a parent should be, he lets his brother down in so many ways -- all because of his own selfishness. I spent the book wanting more for both of them and hoping to see Eggers grow up and was left with left with no reassurances as the book ended. Like I said, it was good. But uncomfortable. Brad brought book No. 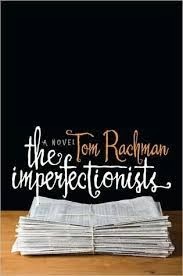 3, "The Imperfectionists" by Tom Rachman, home from work one day. One of his co-workers (and my friends) had given it to him with instructions to pass it on to me. As I recall, the attached Post-It told me I would like it. Never one to question a book recommendation from a fellow sarcastic journalist (that might be redundant) or look a gift book in it's mouth, for that matter, I started reading. The book became my kitchen table book -- the one I'd read when I was eating breakfast or watching the girls color or doing other sorts of kitchen table-y activities. And because it's basically a series of character profiles, it was perfect for that sort of reading. Each chapter shares the story of the editors, reporters and executives who work for a struggling English-language newspaper in Rome. The journalism pulled me in -- all that discussion of style manuals and deadlines and news holes -- and the quirkiness of each of the characters kept me reading. Rachman inspired me to think about the various characters I'm working with, right now. He fleshes each out in a small amount of space such that you feel as if you'd recognize them if you passed them on the street. And using their vignettes as a way to tell the story of the history of the paper and its uncertain future is smart and fresh. I finished this one the fastest, because it wasn't mine and the longer it hung around our house the more likely it would end up becoming drenched in chocolate milk or crusted with oatmeal. Book No. 4 was "To Kill a Mockingbird," which I've already written about. I sped through that one. Did I say I was reading four books at once? I'm now remembering that thrown in the mix with these four were "Gina & Mike" and "The Christmas Violin," both written by a former YDR colleague Buffy Andrews. Both are quick reads, but thoughtful and entertaining. And how could I forget another one I've read over and over and over again in recent months. "Are You a Cow?" by Sandra Boynton. While perhaps not the most literary of the bunch, this delightful little board book is notable for being the first book Jovie has preferred to read rather than chew on. Previously, story time with Jovie consisted of me or Brad trying to read to her as she wiggled away before we made it through the second page. 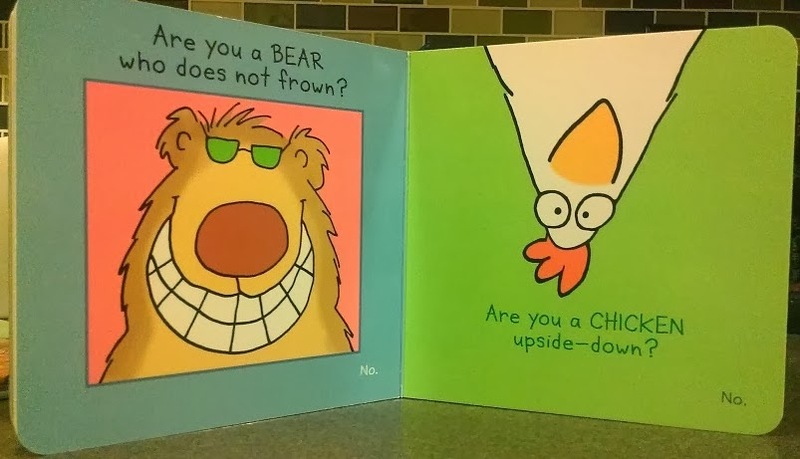 That is, until "Are You a Cow?" She'll not only grab the book from the shelf shouting "Cow! Cow!" before bed, she'll also read the book with you. We also like this page. 'Hup-side doooown?' Jovies says. 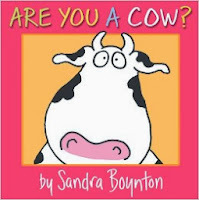 For instance, when Boynton asks, "Are you a cow?" Jovie says, "no." And then when Boynton asks, "Are a dog?" Jovie says, "no." And so on and so forth. On the final page *spoiler alert! * when Boynton establishes that "You're not a penguin," Jovie begins excitedly pointing to herself for the line, "You must be you! Now isn't that great." "Again!" Jovie demands. And who am I to say no?